When music journalist Robert Palmer died on November 20, 1997 at the age of 52, he’d long since cemented his reputation as one of the most astute experts in his field. A fixture at Rolling Stone for over two decades, the first person designated as chief pop-music critic for The New York Times, and an author of six books, Palmer examined and chronicled music with feral acuity while, at the same time, appreciating the best of it with unadulterated joy. “In a style that blended elegance and hipster enthusiasm, he would travel deeper and deeper into his subject, bringing his readers along with him in the interest of turning them on to something he loved,” Anthony DeCurtis writes of Palmer in the preface to the recently published anthology, Blues & Chaos: The Music Writing of Robert Palmer, which he edited. DeCurtis, a longtime contributing editor at Rolling Stone and himself the author of two retrospective anthologies—Rocking My Life Away: Writing About Music And Other Matters and In Other Words: Artists Talk About Life And Work—has been a preeminent voice in music criticism and cultural commentary for nearly thirty years. In addition to his written submissions to the magazine, in the '90s DeCurtis served as the editor of Rolling Stone's record-review section, which led him to work directly with Palmer, the experience undoubtedly informing some of his recollections on him now. Presently, DeCurtis teaches in the writing program at the University of Pennsylvania. In this extensive interview with Donald Gibson, Anthony DeCurtis discusses Blues & Chaos and the late Robert Palmer before generously yielding insight to his own career and craft. Along the way he reflects on music's immeasurable capacity to spark creative minds, the pros and cons of artist interviews, and how one such interview with a certain childhood idol resonates with him today. How did editing someone else’s work compare to editing your own two anthologies? You’re kind of willing to make mistakes on your own behalf. The two collections of my own that I did, I had fairly specific ideas for what I wanted them to be like. And once I got some momentum going on pulling it all together, I didn’t really question that too much. With the Palmer book, I found myself thinking a lot about how he would want to be represented…and about whether or not my own vision of what this book should be would match his. Finally, I just decided, this is what it means to be an editor. I was his editor. So it’s going to reflect his voice and who he was as I understood him. She’s good with symbolism, isn’t she? Yeah, exactly. [Laughs] And her holding it, it just gave me a certain distance of it. I thought, 'You know, it’s actually turned out pretty well.' Just for a moment like this and for her to say that, it was gratifying. In working with Palmer at Rolling Stone as his editor in the ‘90s, was there anything about his style at that point that had some effect or informed the way you appreciated rock criticism? It wasn’t so much that; I just enjoyed reading him. He was certainly a writer that I’d assign things to because I wanted to read that piece. One of the things that probably should be said is how gracious he was. Maybe he was like this with everyone; I don’t know what other people’s experience was. But with me he was very cooperative. If I had a question, he would answer it. Or if I had a suggestion, he would listen to it. There are people who are so difficult. Like you mention in the book, people with bigger egos than talent. Exactly. And that really became my measure, in a way. As I sat there with people, I’d be thinking, ‘With Bob Palmer I would’ve been done in five minutes and I’m sitting here arguing with you for half an hour. You couldn’t stand in his shadow.’ So I definitely took a lesson from that, that your confidence actually enabled you to accept ideas and to accept suggestions. The degree of your talent didn’t mean that you then bullied everybody. It meant that you could still be open. And Bob was. When you say he was open to ideas, was he also open to criticism on a technical scale, if you didn’t like the particular flow of an article or a direction he took? We were in tune a lot of the time, so it rarely came up. But Bob would occasionally veer off. He had a lot of interests that I would regard as esoteric. So if it’s in the middle of a review of a Megadeth record or something—he would go off on a fairly long stint on some aspect of paganism or something he felt their music represented—I would essentially just get rid of that. I suppose there are places where that stuff plays. It doesn’t play in Rolling Stone. And I think he got that. He’d try things and if they worked, they worked. If they didn’t, they didn’t. In the book, for example, the second Morocco story, which is really wild, called “Into The Mystic”—where he’s essentially having visions and things like this—I think he was pretty struck [that Rolling Stone published it]. He wrote about people saying to him, “You submitted that to Rolling Stone?” That one flew. He got that one by. He would, as all writers do, you attempt certain things. And you think, let’s see how much of this I get. Bob was pretty pragmatic, I suppose, is the bottom line here. He understood what the magazine was and I think he accepted that. He occasionally pushed against the margins of what that could be and sometimes he got away with it and sometimes he didn’t. But he was always cool about it. Let me say this, I never had an argument with him. So he never held a grudge for, say, you taking away a semi-colon? Oh, God no. [Laughs] I think he appreciated it. He liked the way his stuff came out. He got it. As wild as Bob was in certain ways, he worked at a daily newspaper for nearly ten years. Anybody in a position like that—writing for Rolling Stone, writing for The New York Times—you’re in a position where you can really have an impact. On the other hand, there are certain things you trade off for that. I think he got that. He liked having an impact. He liked feeling like his stuff was getting read and getting to a big audience of people, not all of whom would know about the things he was writing about. And I think he was willing to do what he needed to do to make that happen. Do you think rock criticism serves more as encouragement for artists to make better music or as encouragement for listeners to refine their tastes? It’s more like an interpretation of the entire phenomenon. Like, why does anybody need to understand why they like Britney’s latest single? But I do believe that a good writer can make you hear things in a way that you haven’t heard them before. They can deepen your comprehension of them. And that’s as true for Britney’s latest single as it is the latest Radiohead album. I think that that’s always true. I wouldn’t presume to think that I could lecture artists on what they want to do. I think they’re almost a lot better off when they just kind of do it and don’t worry about it too much… Interviewing someone like David Bowie, for example—who is as interesting as a critic as he is an artist; and he’s very interesting as an artist—he is somebody who is really able to hear music and think about it very critically, or analytically, I suppose. He’s not somebody who’s going to say to you, “Oh, you know, it’s just mystical; it really just comes to me.” He’ll talk about some R&B record from the 1950s that he lifted something from. And so those conversations—if you’re a writer—are the most exciting ones, where they’re doing it, but they’re also speaking your language. And when Bowie listens analytically, it doesn’t take away his appreciation of the music on a visceral level. Exactly. He still listens and enjoys stuff. He hears things the way critics hear them. He told me a story one time—I was interviewing him for VH-1 for a series on the ‘70s—he talked about being with Brian Eno, when Eno first heard these Giorgio Moroder productions of Donna Summer. He was imitating Eno’s wild enthusiasm about how fantastic these things sounded. And these are two really smart guys, but they both went on to use all that stuff. Yes! [Laughs] I find the ability of music to move across those kinds of thresholds really fantastic. They made that single for purely commercial reasons. It’s designed to get people in a disco up and dancing. Period. But really, really smart, creative people can both thrill to that aspect of it and also get fantastic ideas from it. It’s the great thing about music. I was telling my students the other day [of] the way that something like Kraftwerk, which seemed about the whitest stuff ever done, could totally excite these kids in the South Bronx and really help create hip-hop. It’s the great fun and the great power of a creative act that, once you unleash it in the world, it can go anywhere and it can do anything. Whether that’s in The New York Times or that’s on the biggest label in the world or whether you put it up on YouTube or you’re blogging about it, that’s always true. It can find its audience—and not even whom you think its audience would be. It can find an audience that you never would’ve imagined for it. Absolutely—inspire creativity of all kinds, and fun and excitement and new things. It’s just dizzying thinking about all that. You’ve written about flying to Dublin to interview U2 or traveling to London to talk with Paul McCartney for an hour. What does being in the room with an artist provide you that a phone call wouldn’t? I prefer to do interviews in person. I think there’s something you can do in that situation where you’re just looking directly at somebody; they’re just sitting there. They’re right in front of you. There are ways of reading them that can affect your line of questioning. It’s also harder for someone to look you in the eye and avoid what it is that you’re trying to ask them about. A resistant subject, say, is just easier to deal with in person. The phone just gives them too much advantage. It really takes kind of a will of steel to sit there in front of somebody and stonewall them. Not that these interviews are especially contentious; most of them aren’t. Still, there is a kind of resistance and people fall into their wraps, and that’s just harder to do when you’re there in front of somebody. Any case where you’ve traveled to do the piece and that kind of stuff, it’s also harder to really limit the time too much. He can’t all of a sudden get a call, quote unquote. Exactly. That said, I feel like people underestimate the possibilities of what the phone can be. For the 40th anniversary issue of Rolling Stone, I interviewed Paul McCartney; I did that interview over the phone. The magazine very reluctantly agreed to do that just because it was so late in the cycle. And McCartney, he wanted to do it; he didn’t want to do it. He was going to do it; he didn’t want to do it… Finally he agreed and there was no way to do it in person so we did it over the phone. I think that interview came out fine. There are things that you can do on the phone and for certain type of people it works. The degree of abstraction can work to your advantage. Like, for example, one of my favorite parts of [that] McCartney interview was [because] it was the 40th anniversary of the Summer of Love… I said, “You were in the Beatles. It’s the Summer of Love. Sgt. Pepper’s just came out. What was that like?” In person he might have been a little glib, but over the phone he just kind of disappeared into that moment. He was quiet for a while. And he just said, “It was fantastic.” And he said it in a way that really conveyed it. And he just started going into it. I don’t know that I could’ve gotten that in person. The immediacy of the situation would’ve blocked his ability to do a little bit of time traveling. I [also] did an interview with Eddie Vedder one time. We did the second half of it over the phone; he was much better over the phone. In person, he’s a little shy…very friendly and very gracious, even a little deferential. [He] was polite but not particularly informative. Over the phone, he was much better able to access his own feelings. He felt less like he was being interviewed and somehow the phone gave him the ability to disappear into himself a little bit and then to speak from that place. And that’s ultimately what you want, whether you’re in the room with the person or you’re interviewing them on the phone. You want them to be able to access something in themselves so that they’re not speaking from their head; they’re speaking from somewhere inside themselves. And you can make that work, depending on the person in either situation. We’ve come upon the eighth anniversary of George Harrison’s passing. Did your first interview with him, in particular, have any profound effect on your perception of his music? The hardest people to interview are the ones who made an impression on you as a kid. It’s difficult. I mean, as much as I admire Bono or Peter Buck [of R.E.M. ], I was a grownup by the time I met those people and heard their music; I was kind of formed. I am who I am because of the Beatles. So, meeting [Harrison] was hard. It had a kind of surreality to it. It does to this day… I realized I was going to be in situations where you could just be overwhelmed by the emotions connected with your own experience. Sitting there with him, it was very hard to stay focused and do the work and get the interview done. What I like about that interview is toward the end where he’s talking about his relationship to John Lennon, about a sense that if you can’t experience the spirit of a great friend who you loved deeply after he’s gone, what hope could you ever have of experiencing Jesus or Buddha or whoever it is that you’re interested in? That’s a kind of simple idea, but it’s really powerful. And it’s one that has stayed with me, that things don’t have to be lost. That moment where he just says—quoting Dylan as he did so often—“‘If your memory serves you well, we’re going to meet again.’ I believe that.” The degree of conviction and the degree to which those things were true to him became much more powerful for me, obviously, after he died. But their importance made an impression on me at the time and has for all these years since. 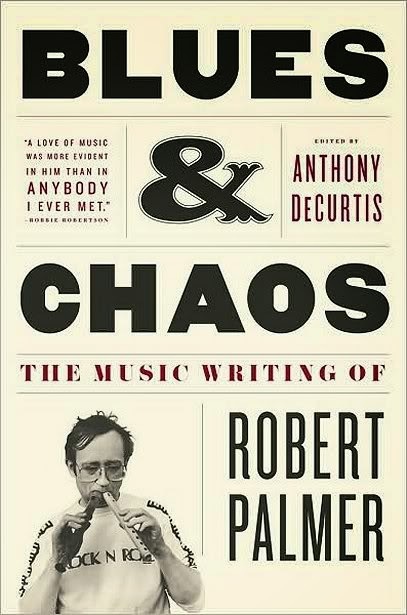 Blues & Chaos: The Music Writing of Robert Palmer edited by Anthony DeCurtis is published by Scribner, A Division of Simon & Schuster, Inc. In Other Words: Artists Talk About Life And Work by Anthony DeCurtis is published by Hal Leonard Corporation. Rocking My Life Away: Writing About Music And Other Matters by Anthony DeCurtis is published by Duke University Press.